"The Secret To Finding Good Gigs"
Is your show calendar full? Do you have more gigs then you know what to do with? Do you know where you'll be playing a year from now? Two years? Three? If you answered yes to these questions, you can stop reading now and please call me because I want to be in your band. This has got to be the number one biggest hurdle you face when choosing to make your living as a musician, singer, performing songwriter, how to find a good gig. Lots of people manage to play around their town, area, region of the country, but keeping those good gigs coming isn't easy, and it's so crucial because without a good gig, you have no money. When starting out in music as a youngster, all bright eyed and bushy tailed, you don't think about these things. You're invincible, it's the glory of youth. The world is your apple and you plan on taking big bites and always having a full belly. As you get older, you're forced to think about it because life kicks in and you come face to face with the real world. Rent - mortgage - bills - spouses or significant others - children, and you need money. Lots of money and now you're older, and you find yourself spending the majority of your time scrambling to try and find good gigs. By now, you're likely to have been in many bands, and you've found that in all of those situations, you were the one who had to book the band and find the gigs. The one who had to push, motivate, sacrifice the most time (and probably the most money), to keep those bands together and performing the gigs you found. You also come to the realization that you've already played all the places that have live music in your area, and that you're already making the most you'll ever make from your existing gigs. You've topped out and the worst part is, you're not making enough to cover your expenses and your bills. You're just not making enough money. So now, all odds say one of two things will happen. If you haven't already taken a job in the "real" world, you do, because you need the money. You need stability, guaranteed income, insurance. In a nutshell, you decide you need out of the music business. Or, you make the decision to get the hell out of dodge, and relocate to the big city. Nashville, L.A., New York City, London, Paris, Madrid, where ever, you choose one and you move. Like I did, moving from Iowa to Nashville, Tennessee, 30 years ago. The world has once again become your apple and you're excited. You're now surrounded by your musical brethren, your fellow singers, musicians, songwriters. All around you is creativity and there are recording studios, music publishers, record labels, lots of big stars, and the bright lights of the city. For the fortunate few, (keeping in mind that your odds of getting hit by lightning are far greater than you ever getting a record deal) the rest is history. Huge success, fame and fortune, lots of money. 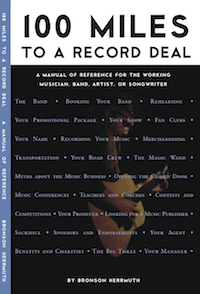 For the rest of us, welcome to the real music business and prepare to meet the other thousands of musicians, songwriters, singers, all in competition for the same good gigs, for the same money. As you settle in and start to get out around town, going to shows, showcases, writer nights, jam nights, you're encouraged to find that you really are as good or better than most everyone that you hear playing. You take a huge bite of your apple, and as you're enjoying chewing, you walk into a club and hear Mark, or Mary, and they are incredibly good and you must admit, by far better than you. A better singer, musician, songwriter, and then next you hear Paul, or Susan, and they're even better and you're blown away. You choke on your apple as you suddenly see the big picture, right in front of your eyes. Your dream of achieving success in the big time music business might take a little longer than you thought. That in fact, you might not be good enough to accomplish your goal of success, and that realization can be quite devastating. Especially since you still have no gig, which means you still aren't making any money. You want to find good gigs? It's simple, find yourself a good agent. A good agent books you gigs, you play them and pay the agent their commission and you are suddenly making money. As you keep doing this you form a working relationship and your agent starts to trust you and finds you more gigs, better gigs, more money. I've been playing music as a pro since 1978, and by far all the best gigs , the shows that were the biggest and that paid the most, have come through an agent. Hands down, no comparison, and the same goes for everyone I know. Is it easy to find a good agent? Of course not, it's actually quite difficult because as much as I hate to admit it, we're not the only one that knows this "secret". Meanwhile, it can be done, and I've done it over and over throughout my career. Over the years I've worked with scores of agents. Obviously, as in any business, I encountered agents that I would never work with again but the good ones, the great agents I was fortunate to meet, are still my friends to this day. Several of them still get me good gigs now and then, because they know when they book me they will get their commission and the buyer will be satisfied. They know I'll hold up my end and perform a good show with a good attitude and be able to deal with all the little negatives, that always happen, no matter the best laid plan. They trust me and I trust them, which makes me willing to travel to anywhere in the world that they would book me, totally based on our long relationships and our mutual respect for each others respective talents. The moral of this story? The secret of finding a good gig is finding a good agent, and then beg them to book you for the rest of your life, which I do hope is a long, long, time. You can thank me now and have a great gig!